Sorry for the laspse in posts.....things have been crazy around here for a bit. Max had another "near death experience" and it has taken several days of having him home from the vet to get his routine back. Also spent time with family while my husands stepfather was in the hospital for surgery. A scary time, but all turned out well!! 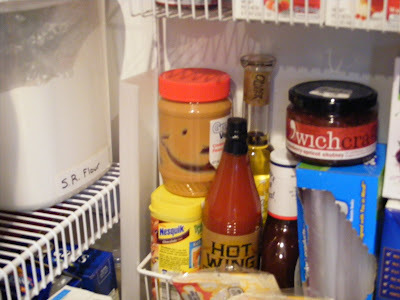 But .....I have the peanut butter gods smiling upon me today so I know all will be well. Found this when I opened the pantry door!! I love PB...and looks like PB loves me too!! LOL!! It's good to be back!!!!! Glad you're getting through everything. Pet your Max for me! I'm glad Max is doing better. I can't believe I'm just now finding out. I know what you mean about sore wrists from knitting way too long. HIGH-larious! Love the PB pic. I wish my peanut butter liked me :-( Hope your thumb is feeling better. ROTFL The Kool Aid guy is in your PB!